Sid Mark launched The Sounds of Sinatra in Philadelphia sixty years ago. It all began with a call from a listener, who suggested that Sid spin one hour of Frank Sinatra tunes. 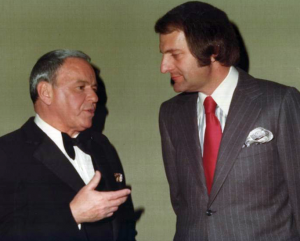 In 1979, Sid took The Sounds of Sinatra to the national level with affiliates in New York and Los Angeles. Soon the show spread across the country to where it is today, airing on nearly 100 stations every week. This is the only radio program of its kind to have been personally authorized by Frank Sinatra! Sid and Frank developed a personal friendship in 1966. To celebrate the anniversary of the show, Sid was invited to see Frank in Las Vegas. After seeing Frank’s show at The Sands, Sid met Frank and a friendship was formed which would last for decades. Visit the Official Sounds of Sinatra with Sid Mark website.